When it comes to our health, we need all the help we can get. When we are feeling a little under the weather, not everyone wants to take a pill or go to the doctors every time they have a headache or sore throat. Plus, calling on the doctor every time costs loads of money. 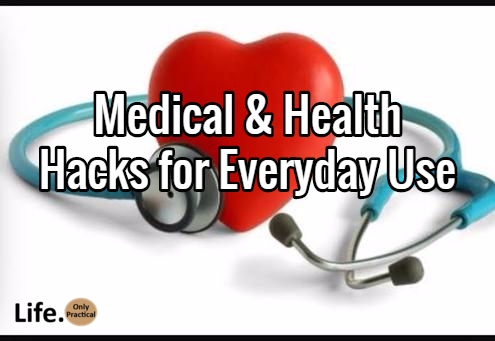 Here are some life hacks that could improve your health. With a little bit of science and a whole lot of ingenuity, try some of these natural remedies and see if they will help your situation out. (Please note: These won’t work for everyone and if you do have something severe it is best to see a doctor). Use a Ziplock baggie and fill with water and rubbing alcohol. It makes a great ice pack that is as cold as ice but isn’t hard as ice and will still conform to your body shape. We double-bagged ours at home to be more durable. To stop coughing at night, rub Vapor Rub on your feet and put socks on. You may also try putting lotion on your feet with socks over it to get rid of calluses as well. Treat Sunburns With Tea. Sipping tea just for its antioxidant punch is so last season. Teabags on a sunburn help soothe as well. Follow directions here to learn how to correctly apply tea to your painful sunburn. Speaking of burns, if you grabbed a hot pot handle or touched the edge of a baking sheet fresh from the oven, then keep a tube of white, minty toothpaste nearby to soothe a minor burn. First, run cold water over the burn, then gently pat dry and spread on a layer of toothpaste. The pain will quickly fade. Headaches are among the most common medical complaints. 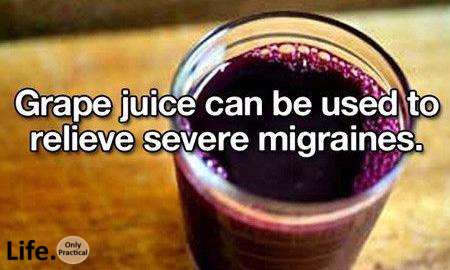 Use grape juice to reduce the severity of migraines. Give your child water or juice that do not contain caffeine. This may help the headache go away faster. If your throat itches, scratch your ear. Doing so stimulates the nerves in your ears and create a reflex in the throat which causes a muscle spasm that kills the itchy feeling. Use a sauna to quit smoking. Go for three days in a row to sweat out nicotine, and it will be easier to quit. Gargle Whiskey for a Sore Throat. Love whiskey, but tired of sipping it straight up (or sipping it at all)? No fear, put some in with a bit of honey and it should soothe your throat in no time. Lemon juice with a pinch of salt every morning lowers cholesterol levels and brings down your weight. Mix a ¼ cup vinegar and a ¼ cup honey and take 1 tablespoon 6 times a day if you have a sore throat. The honey soothes your throat and the vinegar kills bacteria. Or try marshmallows. 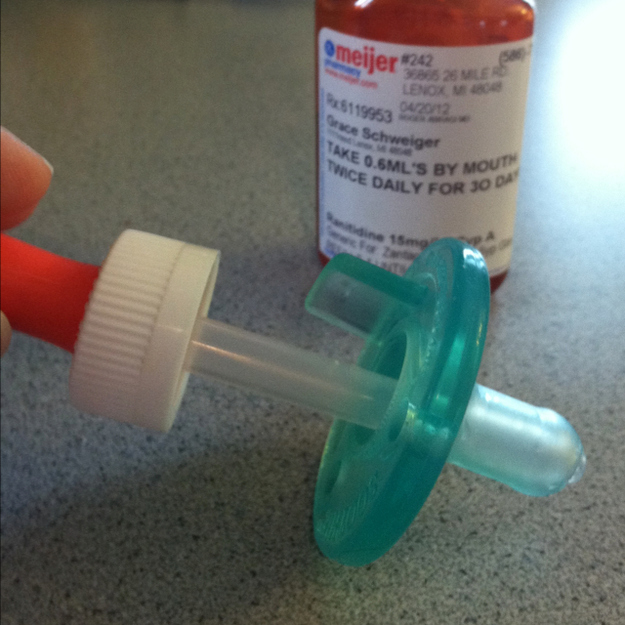 Cut up a pacifier and put a dropper through it. It will be much easier to dispense medicine through it for your little ones. Mouth sores can be painful and make you not want to go out until it is gone. Try putting tums on a mouth sore to cause it to go away in a matter of hours. Shrink a pimple in minutes by putting Listerine on it. The alcohol will cause it to dry up and fade. Speaking of pimples, try popping an Advil Liquid Gel with a pin and putting on your pimple. This should help fade the pimple as well. 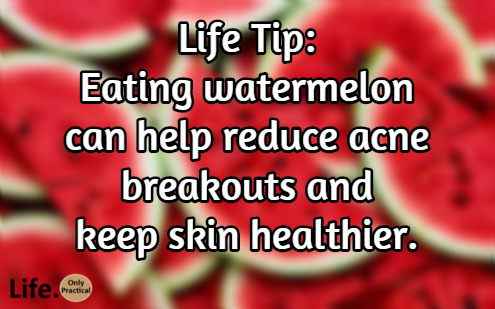 One more for pimples: Try eating watermelon. This delicious fruit is so dense with water, it will help keep skin hydrated and acne at bay. Shampoo your hair with beer. Plus find foot moisturizer and a better way to marinate steaks and cook rice. These four beer hacks will change the way you look at those leftover brews. Moisturize Skin With Honey. It’s good for more than just sweetening food and tea. t’s also a great moisturizer that soothes irritation and blemishes, and it leaves a lovely afterglow. We found some of the most surprising—and helpful—uses for honey outside the kitchen. Exfoliate With Avocado. It’s more than just the basis of our favorite dip. Here are our favorite out-of-the-box uses for avocados that will really enhance your skins’ appearance. Shave With Peanut Butter. Though we love the duo of PB and J. Can we handle it solo? Smoothing peanut butter down shins, instead of toast, may take a bit of getting used to, but believe it or not, peanut butter makes a great shaving gel. Just apply it like you would apply the gel, and shave as normal. As a bonus, the oils in the peanut butter are very good for your skin, so you don’t need to spend even more money on moisturizer for your legs or face. Curse to Reduce Pain. Turns out swearing aloud could help turn down the pain-o-meter. Letting the expletives fly isn’t just a way to cope with pain, it could actually reduce it. Researchers found that study subjects who were allowed to let loose with their language had a higher pain tolerance, less perceived pain, and lower heart rates. Visualize Exercise to Rock a Workout. Research suggests just imagining achieving an exercise goal—like powering through a workout or performing that last rep—can help set the stage for success. Drink Cherry Juice to Speed Recovery. Looking to recharge after a tough workout? Another natural antidote that might spur the body’s recovery after brutally intense workouts is tart cherry juice, which research has found to reduce symptoms of exercise-induced muscle damage. Floss to Boost Brainpower. Not only is dental floss great for your oral hygiene, it is also a great way to boost your memory. Use a strawberry to make teeth whiter. Mash a strawberry with ½ a teaspoon of baking soda to create a paste. Spread the mixture onto your teeth with a toothbrush or your finger and let it sit for five minutes. Rinse out your mouth and brush your teeth with your regular toothpaste. Strawberries contain an enzyme called malic acid that removes stains from teeth. Take a Warm Shower Before Bed. Can’t get to bed? A warm shower will help almost anyone drift off to slumber. Add some warm milk or tea after the shower and drift off to dreamland quickly. If you drink more water during the day, your body has less effort to do at night. This means you can get less sleep if well hydrated. Procrastinating? Wash your face and brush your teeth. Something about being clean really motivates you to get things done. Chow on Fish to Beat Stress. Learn how to fight stress with the omega-3′s in salmon and other delicious dishes. 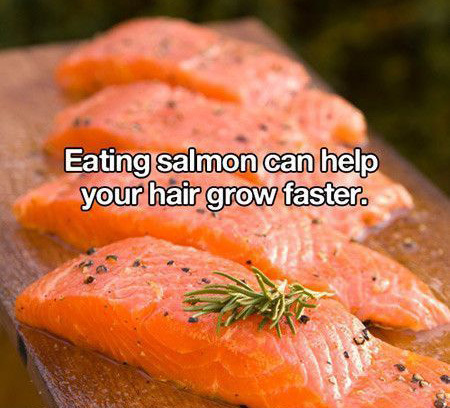 Not only could these fats— often found in fish and nuts— reduce risk of heart disease and cancer, they may also help banish the blues and make your hair grow faster. Take an empty tissue box and attach it to a full tissue box with rubber bands. Then, as people need a tissue, they can throw it away in the empty box. This works great if you are sick or have a cold or allergies. Start Smiling and Feel Happy. There might be more to improving your mood than just “grin and bear it.” Smiling naturally lifts the muscles in the face and slows down the rate at which we age.